Hey, what's your hurry? 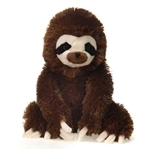 You don't have to be fast to catch sloth stuffed animals, they're even slower than a real sloth! Unless you throw them, then they travel pretty fast! Read more. For the record, we don't recommend hosting stuffed sloth tossing competitions with these wonderful plush animals. Our stuffed three-toed sloths prefer to travel by land, not air. Sure, they'll climb trees with you if you ask them to but that's just because they are happier hanging out in the trees than anywhere else. See, they aren't afraid of heights, they just don't like to be tossed. Can you blame them? Ok, to be honest, one of these three-toed sloth stuffed animals actually loves to be tossed but we don't condone it and we can't tell you which one. You'll have to get your own plush sloth and figure out its likes and dislikes. Maybe you'll get one that loves to be thrown through the air and maybe you won't. No one said that there weren't risks to buying a stuffed sloth. There are risks. Lots of them. You could get your stuffed sloth and find out that your best friend really likes it and then you have to share it or buy your friend one for his or her birthday so that you can have your stuffed sloth all to yourself. You could be climbing a tree with your stuffed sloth and then get all the way to the top and realize that you left your bag of jelly beans all the way down on the ground. Total bummer. We're just trying to warn you that sloth stuffed animal ownership can have its downside. How about this one? You wake up next to your plush sloth, shut off the alarm clock, and start to cuddle. You get so comfy that the next thing you know you wake up and it's noon. Now you're late for school or work because you just had to get in those extra few minutes of cuddling. So the question is; Do you consider yourself a risk taker? Are the possible negative outcomes to having a sloth stuffed animal greater than the potential rewards? We say throw caution to the wind. Get yourself one of these stuffed sloths. Don't hesitate! Live on the edge! Go out on a limb! That's what these awesome sloth stuffed animals are all about...going out on limbs! Shop.